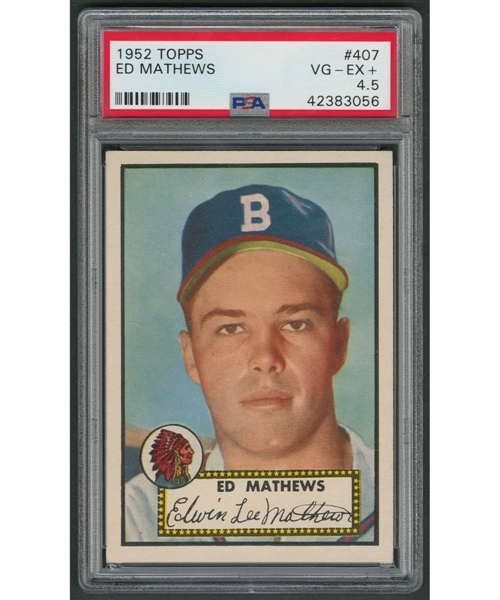 Among the highlights of our consignor’s wonderful array 1952 Topps cards is the Eddie Mathews rookie card, a classic collectible for which there is simply more demand than supply. It’s Mathews’ rookie card and the last numbered card in Topps’ landmark ’52 issue. Only the Mickey Mantle card is more valuable than the Mathews. With pleasing near-perfect centering, card #407 here has recently been inspected by PSA, with the firm grading it just a notch below EX at VG-EX+ 4.5. Thought-provoking image of the young third baseman, (he was 20 when he made his Major League debut with the Boston Braves in April of ’52), brings forth the story of how the lefty hitter smacked 25 homers in his rookie campaign, before a career-high 47 the next season, en route to a career total of 512. Enough with numbers, time to decide whether or not to go for this tantalizing “407”.